Husb and I went up Mynydd Betws (Betws Mountain) today to get our regular supply of farmyard manure for the allotment. We had young nephew with us so we stopped a while to look at the gorgeous view and the sheep and lambs. There are a lot of black faced sheep up there. 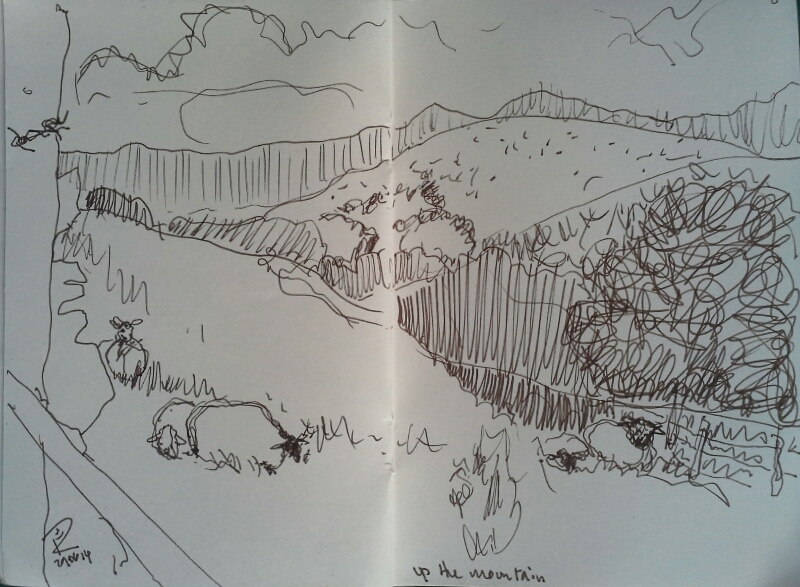 I had a quick scribble into my little A6 spotty sketchbook with a Faber Castell Pitt drawing pen size S. The landscape is so enormous it’s hard to know where to start and how to approach it, but the main thing is to focus on making marks and not try to get in too much detail. I think of van Gogh’s landscape drawings when I’m doing them.